Our second electric conversion starts here. This is not a particularly special Bugeye (at least not yet). We are about to make it special with an electric drivetrain. Welcome to our second electric conversion. With 0-60 times at about 10 seconds (about half of the original), 100 mile range, and smooth torque whenever you want it, this is exciting, for us, for the car, and for the customer! We’ll dress up the interior and make it look like a nice stock driver. Under the hood will be a powerful electric motor with gobs of torque, along with the high tech batteries to power it. 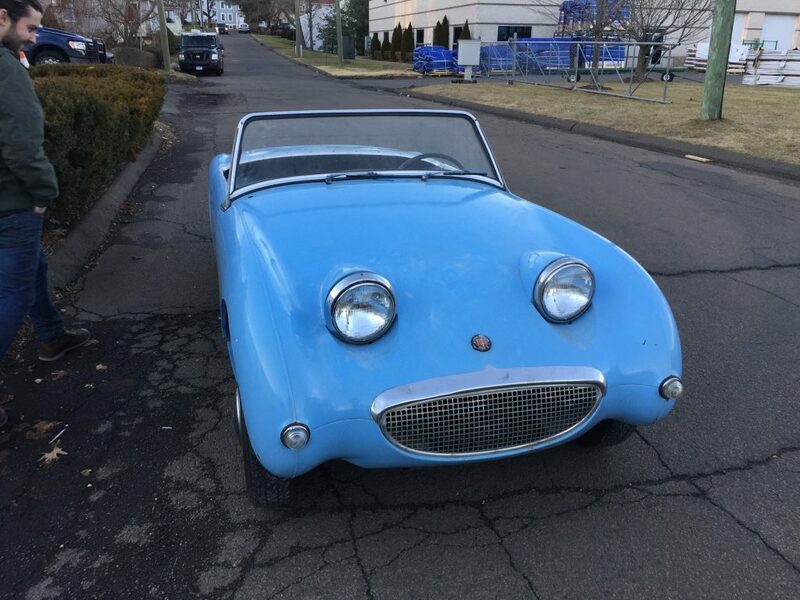 In it’s new guise, this car will go from garage furniture to a reliable and fun machine. Everything you see below in the engine bay will be removed. It’s all pretty worn out anyway. 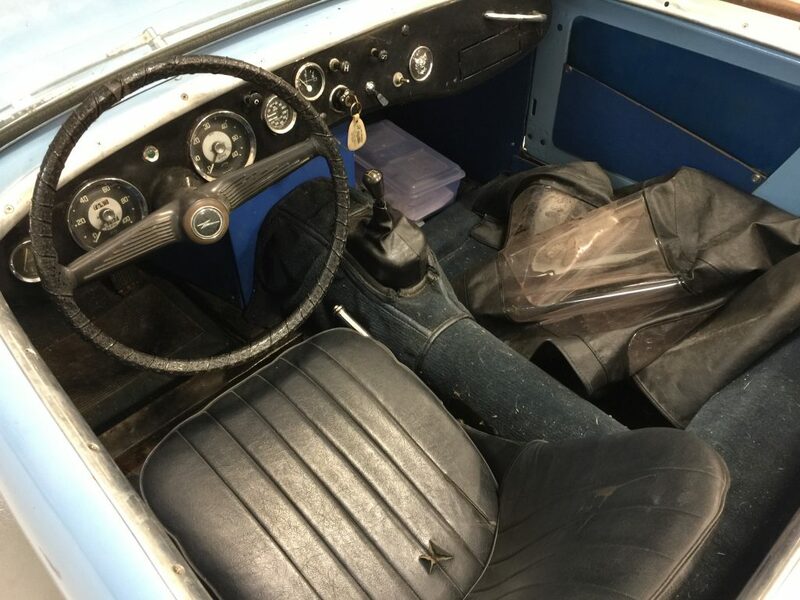 Nothing against restoring cars in this condition… we do this every month. But this particular car would cost a fortune to fully restore because of prior rear end crash damage. As an electric FrogE, that history is no longer a liability. This is the perfect platform for conversion. We have not removed a concours car from circulation, but instead taken another Bugeye out of hibernation. We’ll use proper parts in the interior so that it still looks authentic. 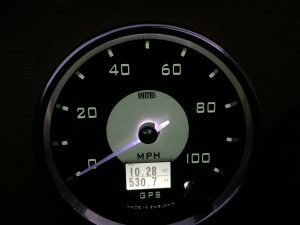 For example, we only use analog gauges, so that the interior still looks accurate. Our goal is to preserve the DNA of the car, while upgrading the powertrain. Stay tuned! You can see a walk around video below. 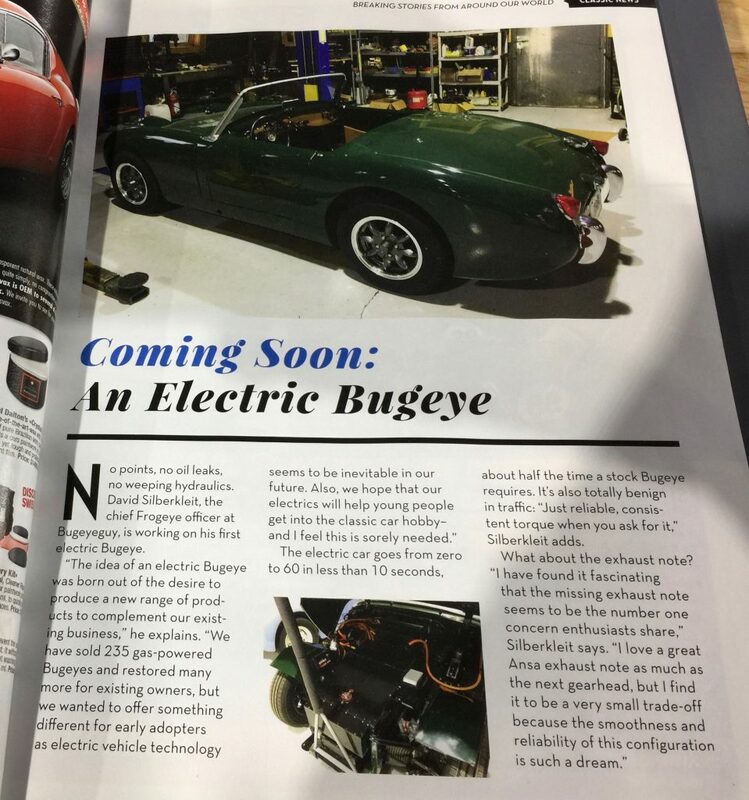 We are close to completing our Electric Bugeye! 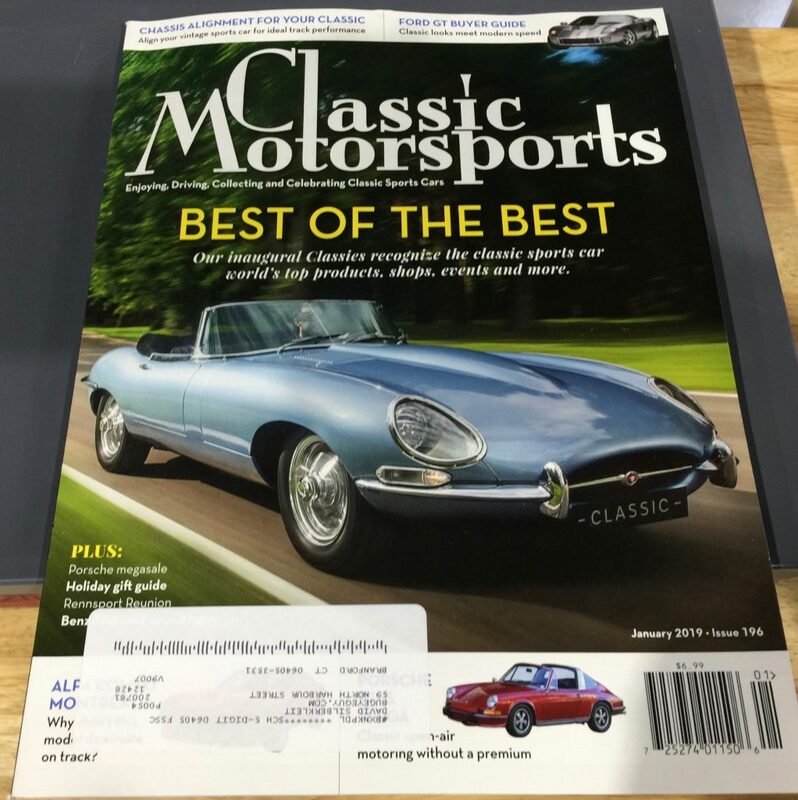 This week, we were honored to have an appearance in the latest edition of Classic Motorsports. We’ve been busy trimming-out the cockpit, where we confronted a new issue… how could we trim around the heavy gauge wires that run through the cockpit and carry juice from the batteries in back to the controller in front? 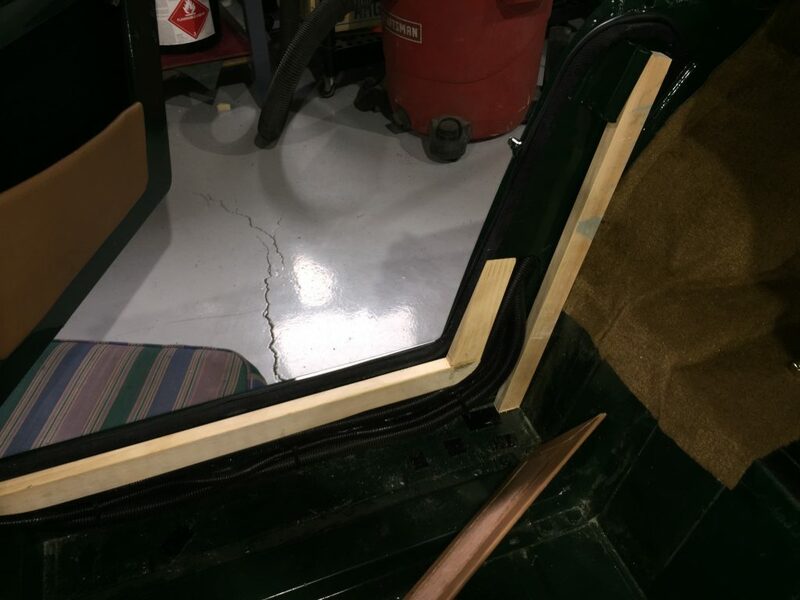 We chose to run the wires at the base of the inner rocker panels just like the factory did on a Stock Bugeye. Original car tail light harnesses ran forward the very same way. 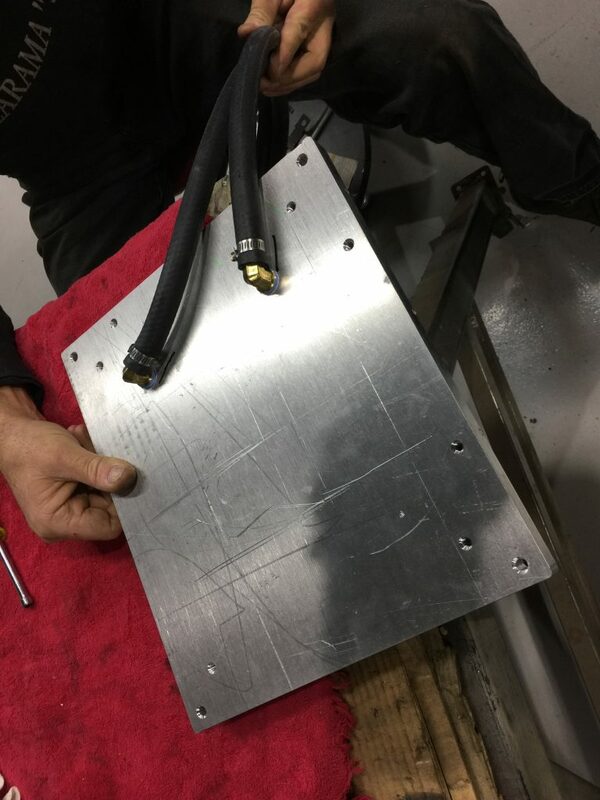 But the original light gauge wires are easy to hide under a masonite panel, while this new technology requires a much bigger void for a series of 12 gauge wires. You can watch Kenny solve the problem in the photos below. First, he secured the wires tight to the inner rocker, as you can see below. Next, he fashioned wood spacers to shim the original style panels outward, so that there would be room for the wires to pass behind. You can just see the black wires sheaths running under the white wood spacers. 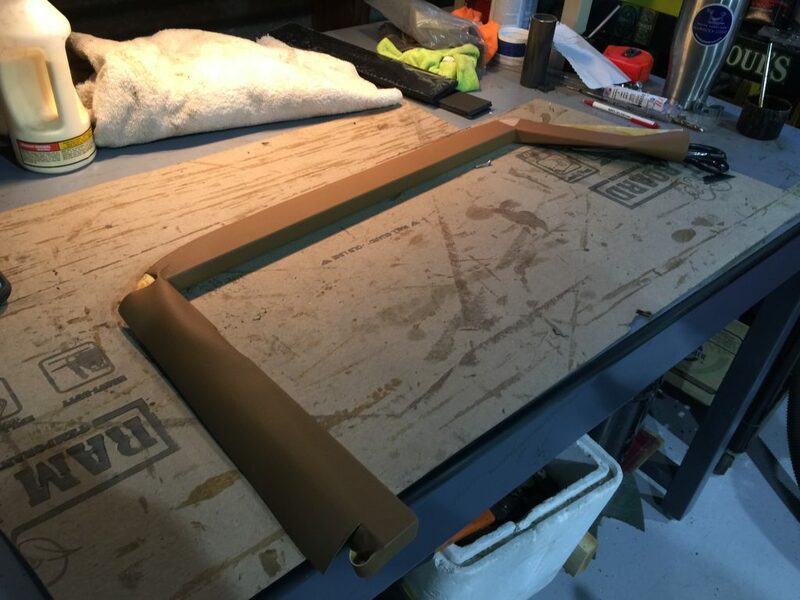 Below, he covers the pieces in matching vinyl, in preparation for mounting them them in the car as you can see below. Now, our high voltage lines are well sheathed in a masonite and vinyl soffit, and the interior still looks close to stock. We’re all really excited about the result, since it evokes, acknowledges and pays homage to the original factory way. 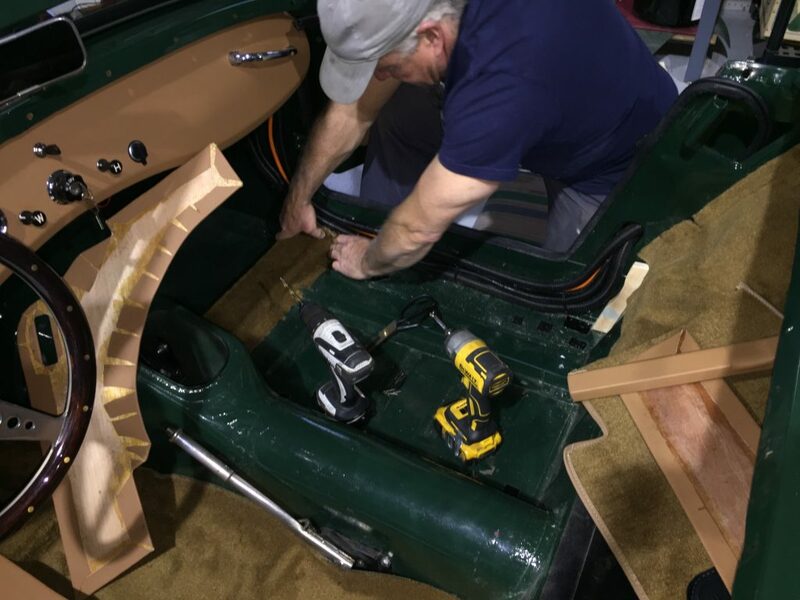 Remember, our number one priority with this project was to protect the vintage car experience while adding a modern electric drivetrain. 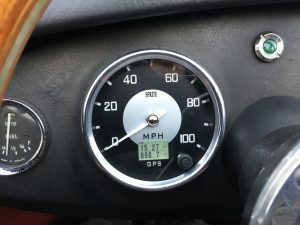 Thus we stayed with analog gauges and retained as much of the original interior design as possible. This car will be done next week, and we will be starting on car #2 shortly. 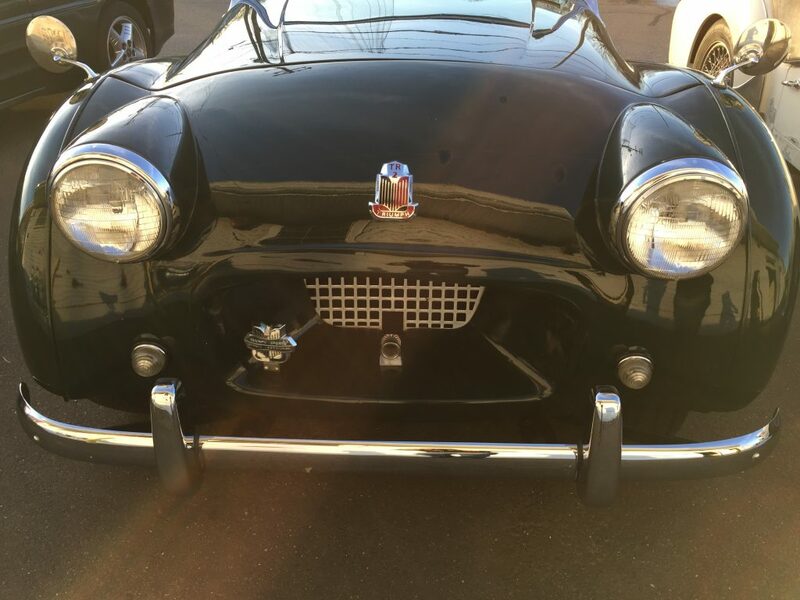 If you want us to convert your Bugeye to electric power, please get in touch soon, as our winter schedule of gas and electric projects is filling up quickly! 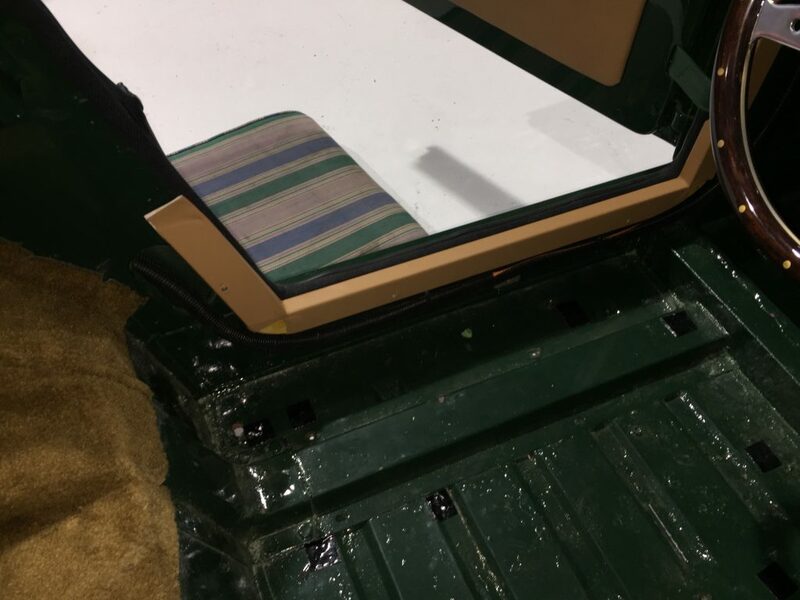 Our electric Bugeye is now ready for its new interior, and we are very excited. The car is sorted and exceeds our expectations mechanically, and now we can make it look stunning. Stay tuned! If you have been following this project, you know I am in love with it, mainly because it is smooth and consistent. I get the feeling that it will be just as smooth and consistent in 100,000 miles. This is a big service interval in the British classic car world, where the life span of a newly rebuilt 948 engine may only be about 50,000 miles. 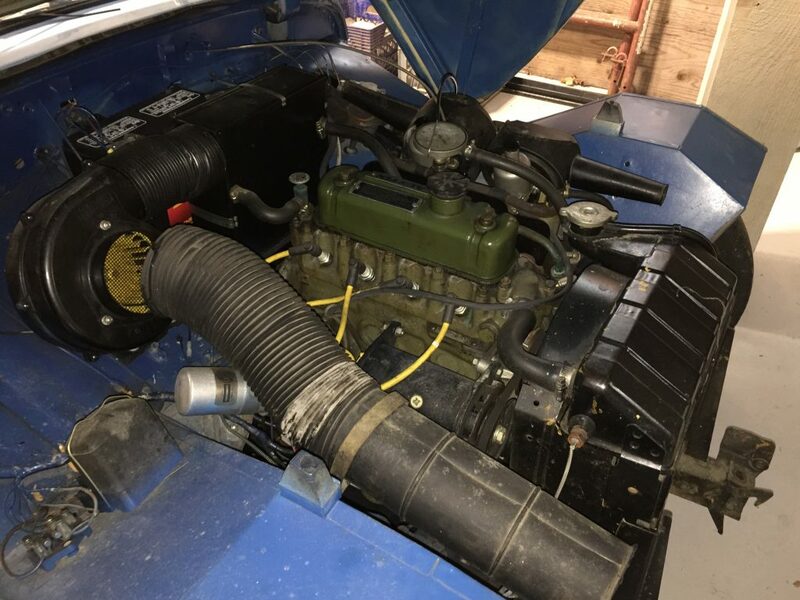 This week, I wanted to share two videos… the first is of a gas powered Bugeye with a newly rebuilt 1275 engine and five speed Ford transmission. We installed this upgraded powertrain for Len from New Jersey, and finished it with the same anthracite wheels and new tires you see on the electric Bugeye. 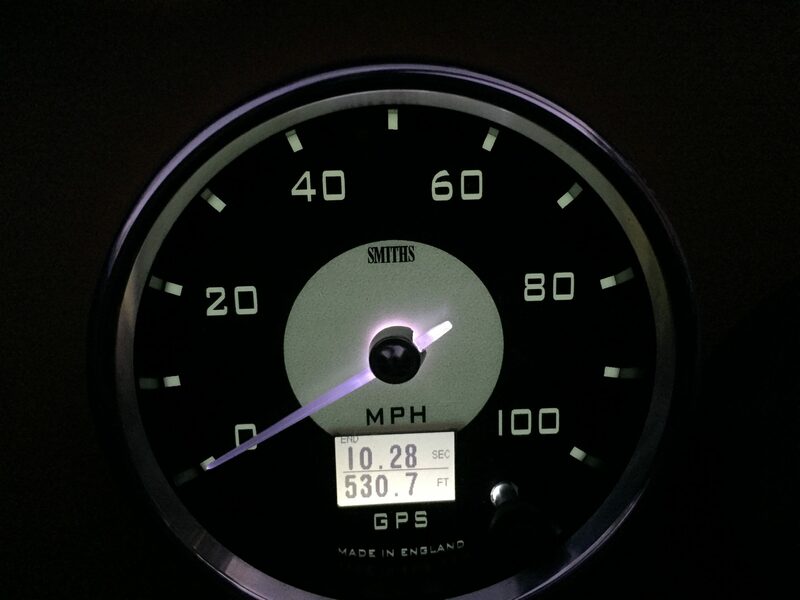 Len’s car now tracks like an arrow and cruises beautifully at 70 mph, @ about 3300 RPMs in fifth gear. The electric turns 4800 rpms at 75 mph. You might notice the that electric motor really comes on as the RPMs climb. We will next switch to a 4:55 rear end for even more off the line performance. This will raise the RPMs on the highway, but this electric motor doesn’t care the way our gas engines do. Load matters more than RPMs. Range is about 100 miles per full charge. This car is fit with a fast charger so it works at highway charging stations. 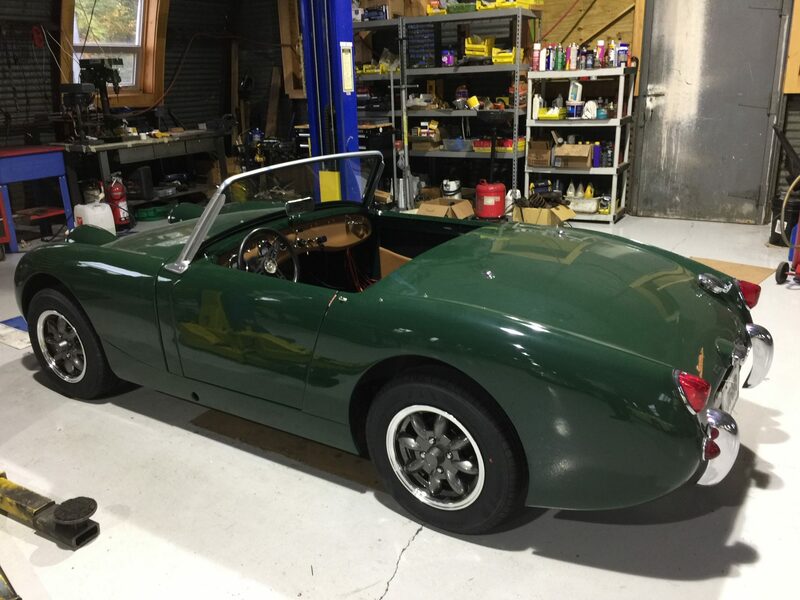 We look forward to the next electric conversion… if you have a Bugeye sitting on your property with a worn 948 engine and transmission, our electric direct drive conversion is an attractive option! Or, if you would prefer a rebuilt 1275 with a five speed, we have that kit in stock too! Call or email to get your car on our winter schedule! We can pick up your car anywhere in the country, even if it doesn’t run. 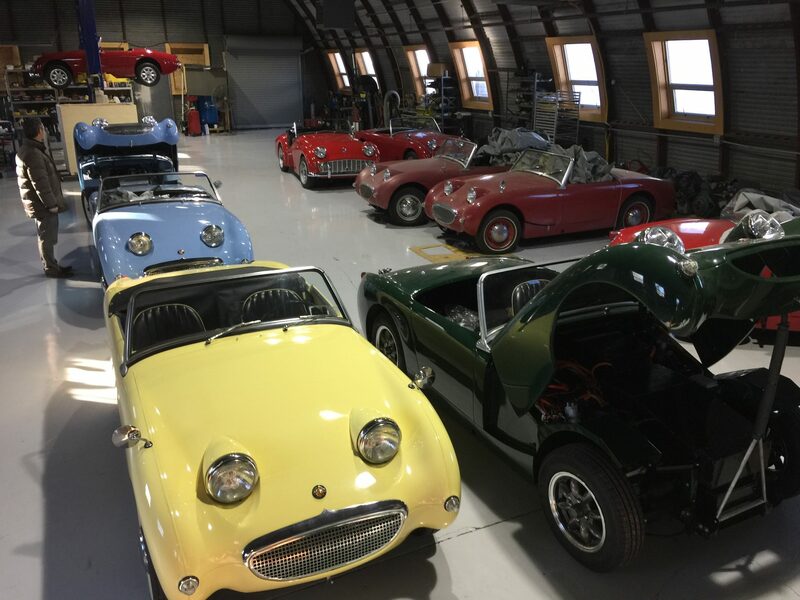 This was a busy week, with a full house of Bugeyes needing various repairs and restoration work. 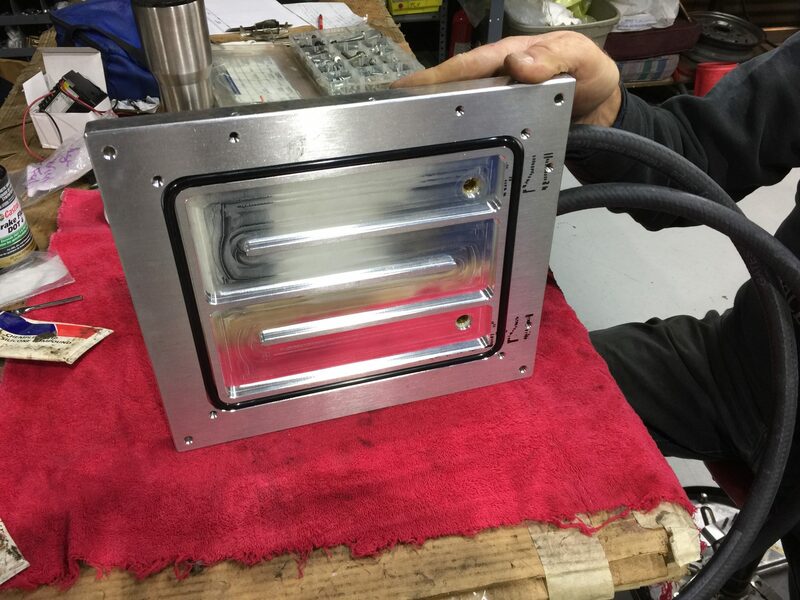 Our electric project is still a priority, and we made time to add a new radiator to our prototype electric car. This one is tiny, all it has to do is cool the controller, the brain that manages the batteries and motor. Juice comes in, juice goes out! The AC Bugeye Electric motor controller, roughed-in place, with more wiring to still complete. I know that the Bugeye Sprite is all about simplicity, and an electronic brain is exactly the antithesis of what the Bugeye is all about. But until further notice, I am hooked on the smooth and maintenance free/turn-key operation of an electric Bugeye. In addition, of the 19 Bugeyes in our building at the moment, the electric is by far the fastest of the bunch. So if we need to add a little cooling to keep the brains of the operation happy, I am more than willing to comply. I thought you might find this story interesting, as it represents one more way in which we had to engineer a solution to a British car challenge. It turns out that the controller is smart enough to de-rate the power it will transmit to the motor if it gets too hot. You can still limp home, but you don’t get the full power that makes this vehicle so addictive. We set out to fix the problem once and for all so we added a liquid cooled chill plate under the controller. The silver plate you see in the photo above sandwiches underneath the controller box. You can see the recesses that will carry the antifreeze under the aluminum case that houses the controller. The square O ring around the perimeter keeps the antifreeze in place. 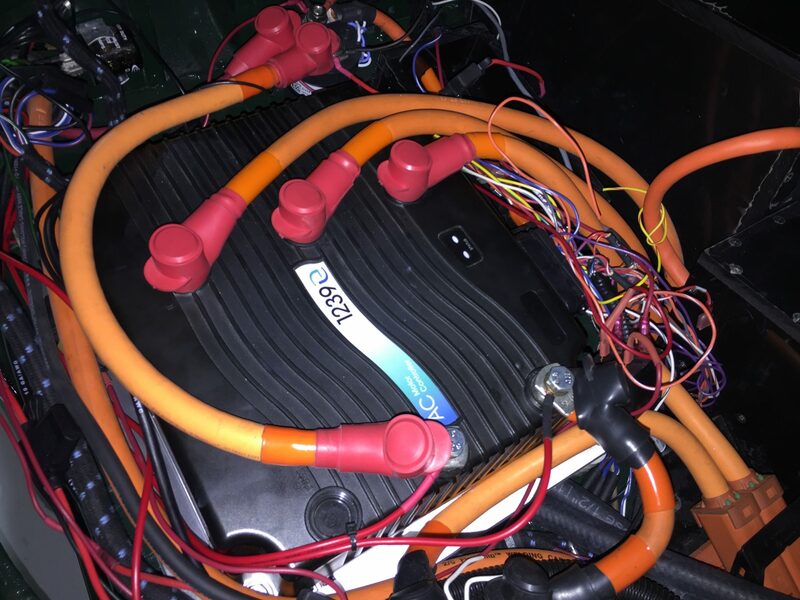 Two half inch hoses and a small pump allow the antifreeze to circulate to a small heat exchanger we fit alongside the batteries. Now, the controller will stay much cooler, which will allow us to send more power to the rear wheels. And thus our car is almost ready for range testing. If the weather improves, we will be out driving the car throughout the balance of the month. Our Electric Bugeye is moving forward nicely. This week, we put on the new wheels and tires and made our first highway test up to 78 MPH. You can see that happen for the first time in the video below. I am still in awe of the simplicity of direct drive from an electric drive system. It feels to me like it will spin forever without any maintenance at all. No clutch issues, no slave cylinders to change, no synchros to wear and no valves or rings to wear out. And of course, no oil leaks! Some have said that the exhaust note is elemental to the British sports car experience and while I completely agree, for me, I am willing to give up that sound in exchange for a (mostly) maintenance-free British Sports car. We have dedicated the last ten years to building more than 200 gas-powered Sprites that our clients drive with a high degree of reliability. This drivetrain takes the standard to a whole new level. Charge, get in and go. 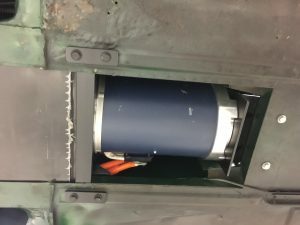 On the lift this week for the wheel swap, I admired the clean electric motor with not a single oil drip in sight. 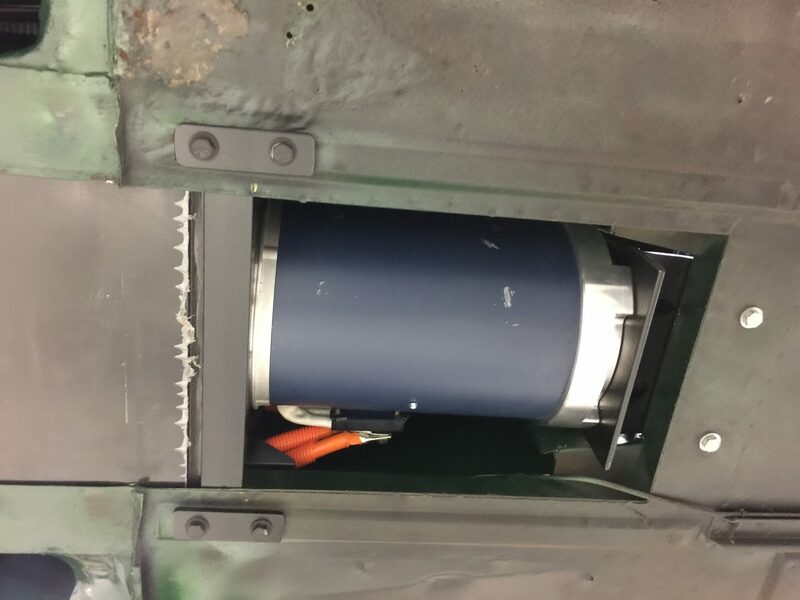 You can see the bottom of the battery box in front of the motor. This is made of polyethylene sheet, with a thick plastic film showing at the edge. We’ll peel that off when we get the project completed. We’re booking electric conversions for this fall. Electric kits will also be for sale, but not for a few more months. Our new GPS Sprite speedo allows us to measure zero-60 times. You’ll see me stage the instrument in the video below. Scroll through the functions to 0-60 timer… once keyed, the timer starts when the car begins to move. Click play in the video below to watch! 12.77 seconds is not going to win any prizes. But a 948 powered Bugeye which would be lucky to break 20 seconds to 60 when new (Road & Track quoted 20.8 in 1958), so this is very impressive, and a whole lot of fun. The power is smooth and progressive. It ain’t the sound of a Stereo muffler, but the electric motor has a distinct whoosh that is also surprisingly fun to hear. 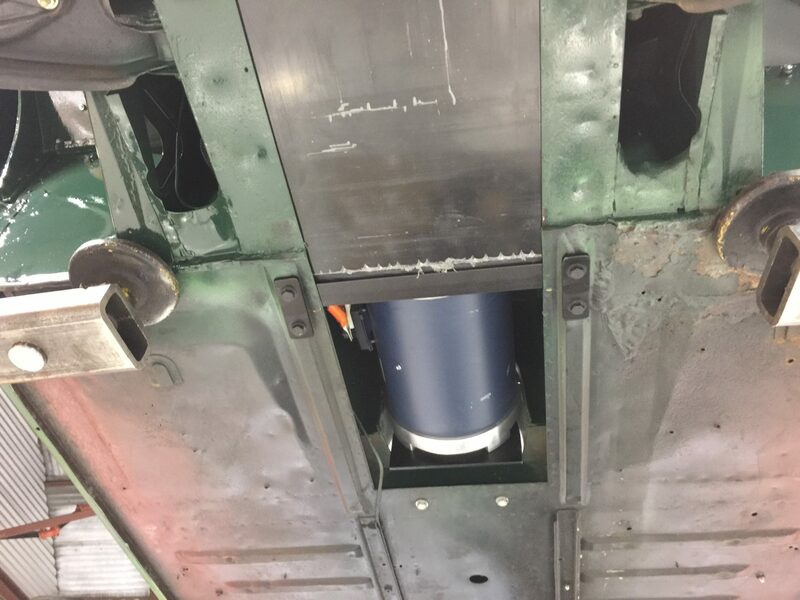 You can see the custom driveshaft doing its job below. We love gas powered Bugeyes. 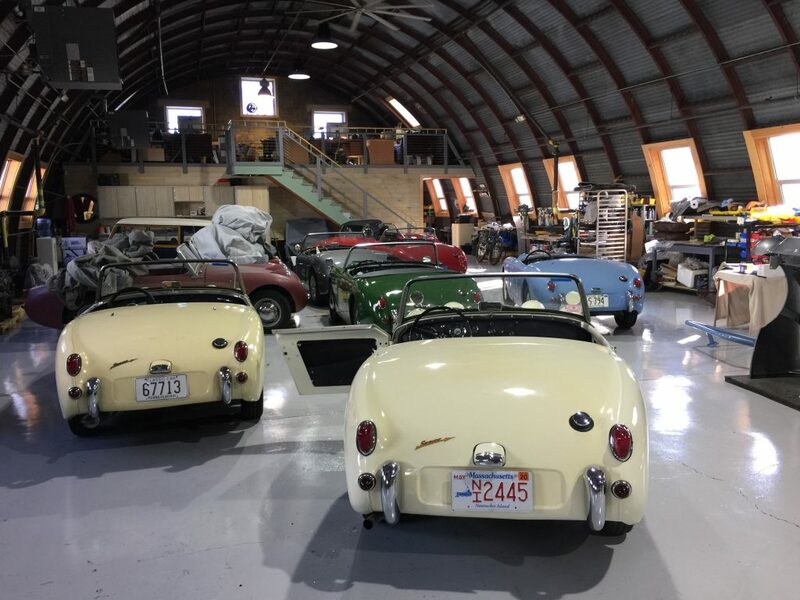 We have cars here currently from Oklahoma, Wisconsin, Pennsylvania and Idaho, and we are sorting them all out, chasing down every noise and rattle, and tuning them for optimal performance. Our electric Sprite is a welcome change. Most dramatic is coming the familiar stop sign at the end of our block, just as I do with the other four Bugeyes I am testing prior to their departure. At a stop there is, of course, nothing. No noise. Nothing to manage. No throttle to blip or choke to pull. Just silence. Noises, when present, have to be right. Many noises are telltale indications of problems. So we listen very carefully. While this electric car is missing it’s sweet exhaust note, most dramatic is that is has no bad noises at all! And that makes it quite refreshing to drive! In the coming weeks, we will finish this electric car. We’ll clean up all the wires and put in the complete new interior, and other appointments, which we will share here when they are done. Some of you have asked for conversion kits. Those will not be available for a while, as we need to further develop the kit so that it can be installed at a DIY level. We are, however, scheduling electric conversions here in our shop for the coming months. If you have a Bugeye for example with a rusty fuel tank and played-out 948 engine, we would be happy to pick it up make it a great driver. We can put in a new fuel tank and rebuilt engine, or, now for the first time, we can convert it to electric power. 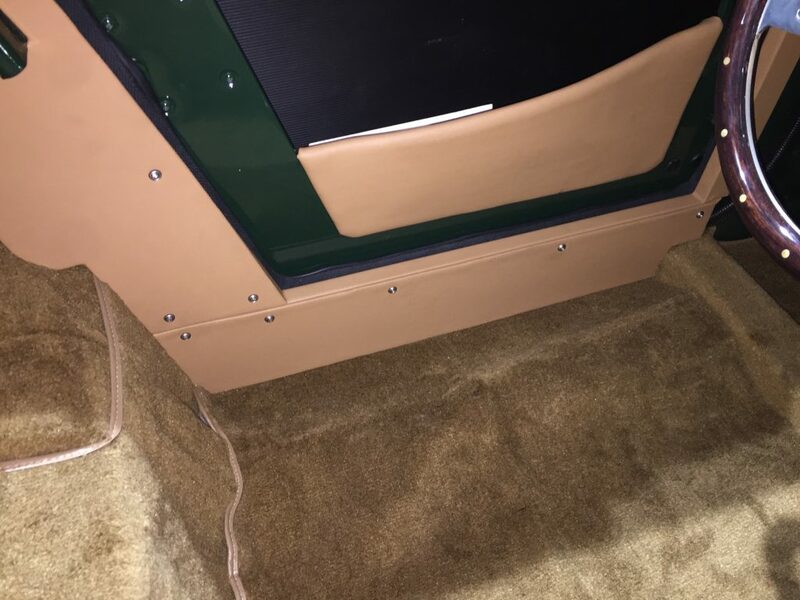 For us to install a complete electric conversion, I would budget $35,000 for the complete kit and labor to remove the gas powered driveline and replace it with the electric systems needed to charge and drive with about a 100 mile range. If you are interested, call or email to discuss your project! We’ll keep the gas powered (and electric) Bugeyes rolling!